This cute baby blocks cake is full of creative details. You would never know by looking at it that this was Grace's first cake decorating project. I am blown away at how awesome it looks. 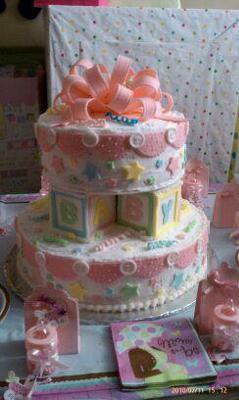 This is a perfect example of how anyone can make a beautiful baby shower cake, even if they have little experience. I absolutely love this cake. Great Job Grace! Thank you so much for sharing it with us! My limited experience with baking cakes comes out of a box. So, when my nephew's wife asked if I would make the cake for her baby shower I happily said yes (knowing I would probably just buy one). To get an idea of what I wanted to buy I started looking online at pictures and recipes. That's when I thought to myself, "these are really cute cakes and all the instructions are there. I'll try to make it myself!" I followed the instructions and found other tips for using fondant and gum paste. I actually surprised myself at how well it turned out. So.....the message is.....TRY IT! You'll probably surprise yourself, too! Happy baking!